Batsman have taken special liking towards Mohit Sharma's bowling as he features in 3 such spells in 4 matches. Great stuff by the batters to find the weaklink and execute the tonking. Surprised to see Bravo here. He scored a 50 in just 3 overs. 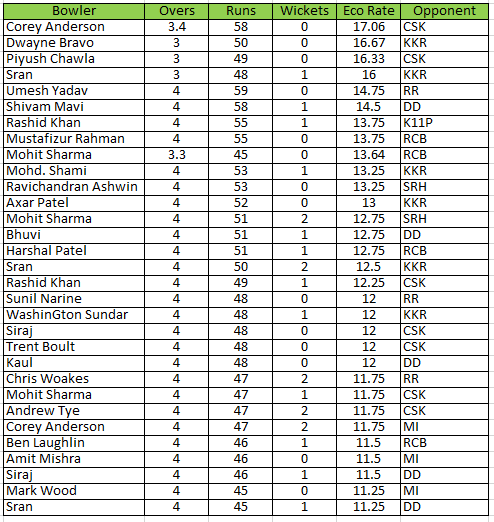 Highest rpo followed by Chawla and Umesh. Why are you so concerned about worst? and not the best. It just gives me a feel of negativity. 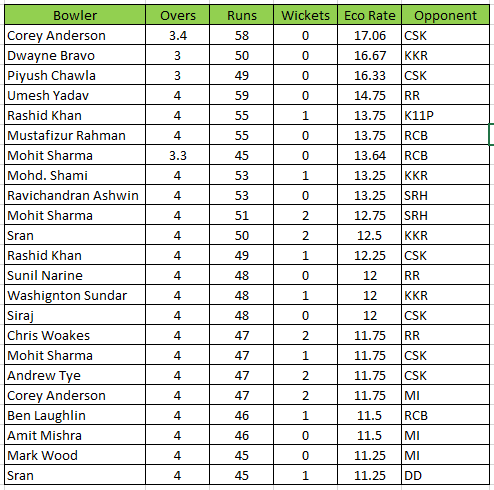 In T20 cricket, there is no place for looking at worst stats for bowlers because bowlers are always going to be at the receiving end and should always look at best stats. I guess you have not checked top wicket takers thread. 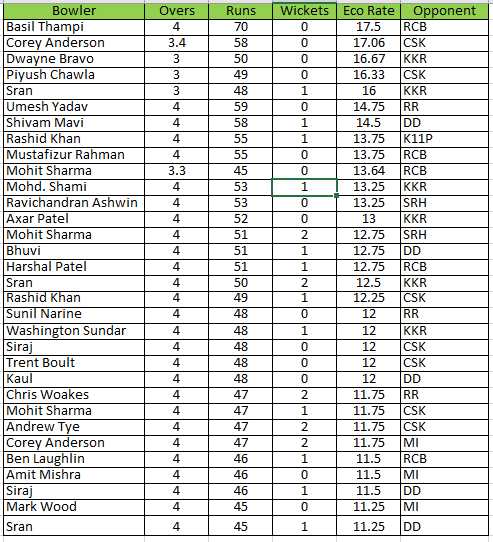 Check it and comment on that thread that it is negative as batsmen are not mentioned. LOL. What is negative in batsman scoring runs and bowlers taking wickets.As far as i am aware cricket is game of batting , bowling and fielding. I like to watch runs being tonked, wickets being taken and fielding too. i am not talking about batsmen scoring is negative. I said about positing worst stats is negative feeling whether it is batsmen or bowler. 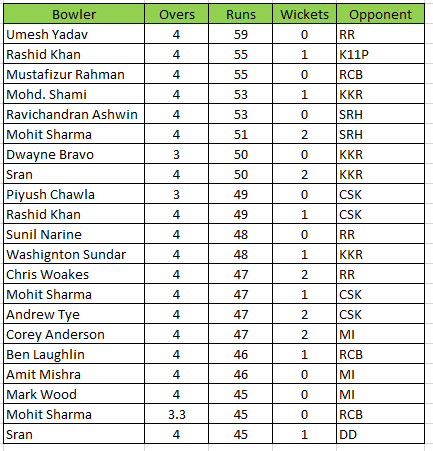 Seems Mohit Sharma is the bunny of the batters.Think many teams have identified him as weak link and attacking him. 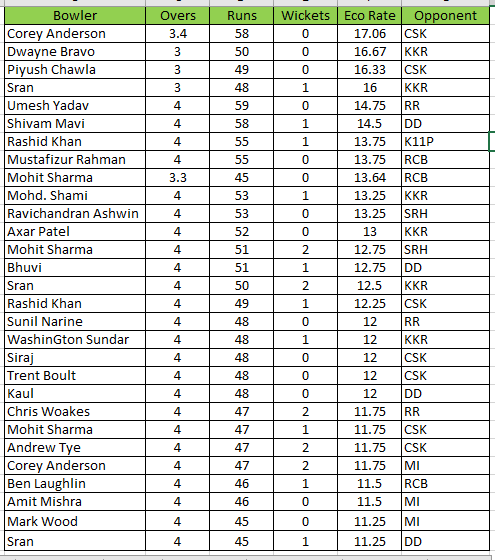 We discuss top wicket takers on one thread and top batting by batsman on other thread.Whats wrong in it? You think too much. Will correct in next update. 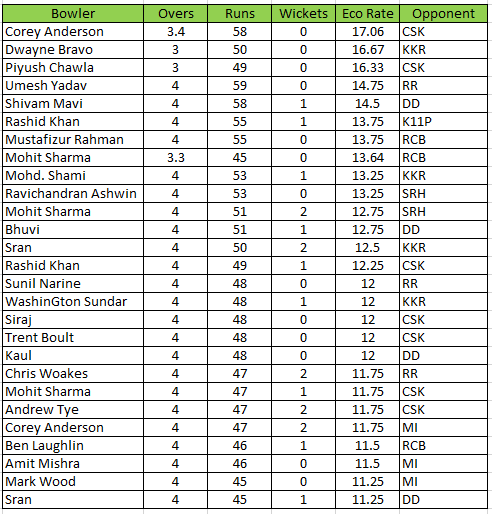 8 wickets (all top order) in 5 matches with 8.6 RPO. Highest no. 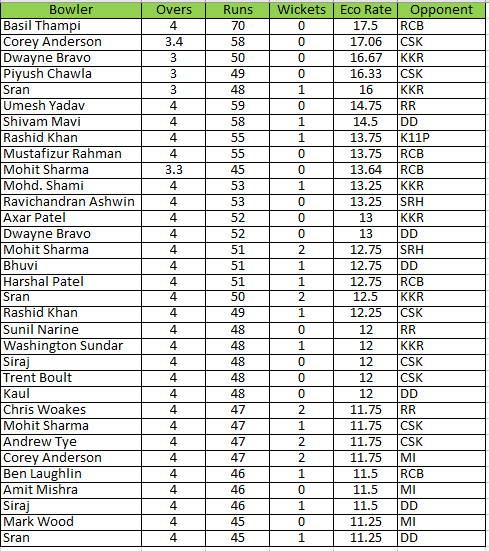 of wickets among all pacers. Your trundler favourite Unadkat has 2 wickets in 5 games, going at 10.6 RPO. + Sran. He makes another worst spell. ++ Siraj and Corey. Will update the table tonight. Another wonderful exhibition of clean hitting. 4 overs 58 runs 1 wicket. 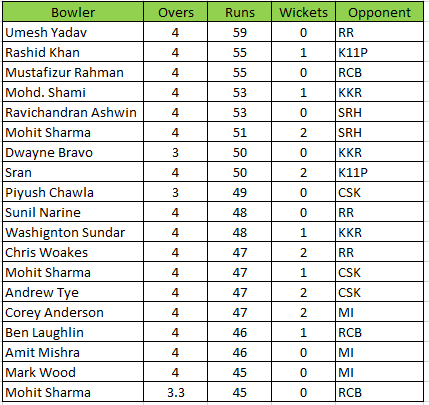 kxip has two expensive bowlers in mohit and sran so far and even ashwin went for runs in one of the games. Eco rate column was updated later. Trying to keep things as simple as I could. ++ Rishabh tonking Bhuvi and Kaul . Mohit and Sran have 3 listings each. Harshal Patel 51 from 4 overs today. + Basil Thampi bowled the worst IPL spell ever. Probably the worst RPO for anyone that has bowled more than 1 over? 9 spells by Punjab bowlers wherein they have given 45+ runs in their spell. It would be very difficult to beat Thampi's thumping. 4 overs 70 runs. R u kidding. He has it coming for him. Who would name their kid thampi ?. He got thumped. 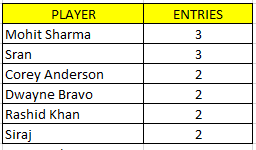 A lot of uncapped bowlers who have still not come to terms to T20. I would say an uncapped pacer will be the one who breaks the record again. 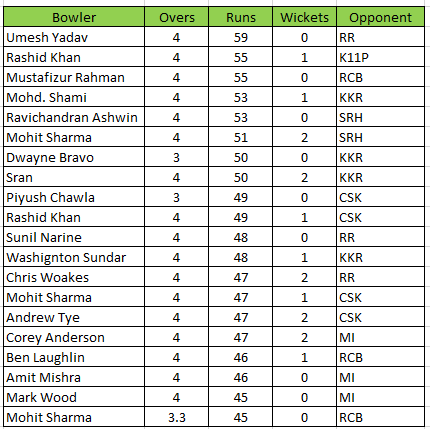 4 overs 56 runs 0 wickets versus SRH in yesterdays match.